After seeing both Anne and Jennifer mention the idea of cafÃ© brulÃ©, I just couldn’t resist giving it a try myself. 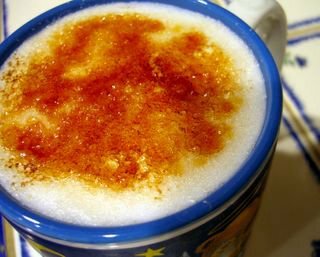 The drink can be any of your ordinary, foamy, steamed milk-topped favorites and is sprinkled with a fair bit of sugar before applying a kitchen torch to caramelise it into a crÃ¨me brulÃ©e look-alike. I love the idea and I loved using my kitchen torch on my coffee even more, though I would recommend scattering the sugar further over the foam than I did, let is caramelise into one sheet of sugar. The coffee is really what is special about this drink, though. It is my recreation of Trader Joe’s seasonal coffee offering, their “Wintry Blend”. The whole bean coffee has whole cloves, red and green peppercorns and small pieces of cinnamon that get ground up with the beans in your coffee grinder. The resulting coffee is deliciously spicy. Now, to make this yourself, you might have to play around with proportions. I suggest starting light on the spices and working up, since no one wants to actually taste pepper in their coffee. Once you get it down, though, the coffee is warming with a perfectly wintry smell and a hint of spicy flavor. It is nice black, with sugar and/or milk, so don’t feel that it isn’t worth a try if you don’t have a way of steaming milk at home. If you don’t grind your own beans (a practice I highly recommend), just add a dash of cloves, cinnamon and a grind or two of pepper to your coffee grounds before you brew a batch and you’ll get a similar result. The exact amount of spice you’ll need depends not only on your personal tastes, but on how much coffee you brew at a time. I suggest starting with about 3 cloves, 3 or 4 peppercorns and a good sized pinch of cinnamon for 1/2 cup of beans, grinding it all in your coffee grinder and adjusting as necessary. Now this sounds amazing. I’ve ground cinnamon sticks into my coffee, but never peppercorns! I’ll try it today. Thanks, Nic. Well, I found this article very inspiring.I love my coffee and I am already set to try this new twist.Happy New Year!!! Scott got a new coffee maker and a bean grinder for Christmas. I think we’ll try this tomorrow. Mmm..that looks good! Happy New Year to you, Nic…wishing the best to you and “bakingsheet”. All the best for the new year Nic – thank you for sharing your culinary experiences and wonderful posts. The brulÃ© version is definitely something I’ll have to try with my next cup – great idea to combine the aroma of the coffee with the caramelized sugar! We still have a bottle of Kalua, which was originally intended for a spiced up crÃ¨me brulÃ©e, but thinking about it, wouldn’t it be nice with coffee, too?! a lovely idea! happy new year to you and your family. Yours is beautiful! Happy New Year! Wow – cafÃ© brulÃ© That is a cool idea! Hard to get the red and green peppercorns where I live here in the UK (but not impossible) but I’m certainly going to try the clove cinnamon and some white pepper (that really sounds like such a weird idea!) But this clinches it – am definitely off to eBay top see about getting one of those mini blowtorch thingies! I can’t wait try this – I adore a nice Latte and Cafe Latte BrulÃ© sounds like a combination to die for! thanks so much for the spiced coffee recipe. I was so disappointed that tj’s is not carrying it this year, as I was looking forward to having it again.